We consider situations in which a decision-maker with a fixed budget faces a sequence of options, each with a cost and a value, and must select a subset of them online so as to maximize the total value. Such situations arise in many contexts, e.g., hiring workers, scheduling jobs, and bidding in sponsored search auctions. This problem, often called the online knapsack problem, is known to be inapproximable. Therefore, we make the enabling assumption that elements arrive in a random order. Hence our problem can be thought of as a weighted version of the classical secretary problem, which we call the knapsack secretary problem. 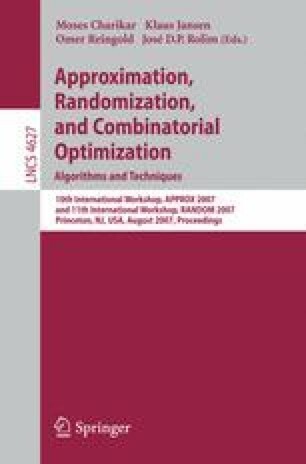 Using the random-order assumption, we design a constant-competitive algorithm for arbitrary weights and values, as well as a e-competitive algorithm for the special case when all weights are equal (i.e., the multiple-choice secretary problem). In contrast to previous work on online knapsack problems, we do not assume any knowledge regarding the distribution of weights and values beyond the fact that the order is random.